Above: beef and pork ribs were superb at Roegels Barbecue Co., one in the new wave of independent bbq joints in Houston. A few weeks ago, Houston Chronicle barbecue columnist J.C. Reid (a good friend of ours) published a story, “Barbecue and wine: The final frontier,” about a recent visit to Napa where he was pleasantly surprised to find a solid and intelligent barbecue restaurant with a 400+ lot wine list. The restaurant is called “Bounty Hunter Wine Bar & Smokin’ BBQ.” Almost sounds like an oxymoron, doesn’t it? His story about Bounty Hunter, the growing interest in bbq across the U.S., and how it’s opened up a new dimension in wine pairing echoes something he wrote a few weeks earlier. Over the last five years, I’m sure he would agree, Houston, a city previously not known for its bbq, has become one of the epicenters of the bbq renaissance. Today, smokers like Killen’s and Cork Screw in Houston regularly appear in “best bbq” listicles published throughout America. Above: the smoky, bacon fat character of the Syrah in this wine by Denner worked well with the Roegels spread. This cult Paso Robles wine had nice acidity and restrained, elegant wood. I liked it. But at 15.6 percent alcohol (holy cow! ), you couldn’t really call the wine balanced. 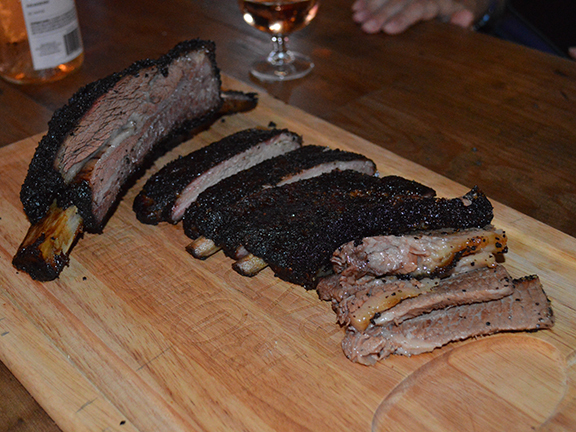 On Saturday, he invited us to an informal wine tasting at Roegels in Houston, one of the city’s latest entries in the new wave of bbq here. There were roughly 15 people in attendance and a handful (including me) brought wines to share. When I saw the bottles lined up, it struck me: aside from a bottle of Champagne (that worked brilliantly with the meal), I was the only person who brought wines other than red (I brought a southern France rosé made from Mourvèdre, a macerated white from Campania, and a Negroamaro). As Texas bbq culture continues to seep gush into gastronomic hegemony, it was only natural that wine-loving Americans would want to pair their favorite bottles with a new favorite cuisine. 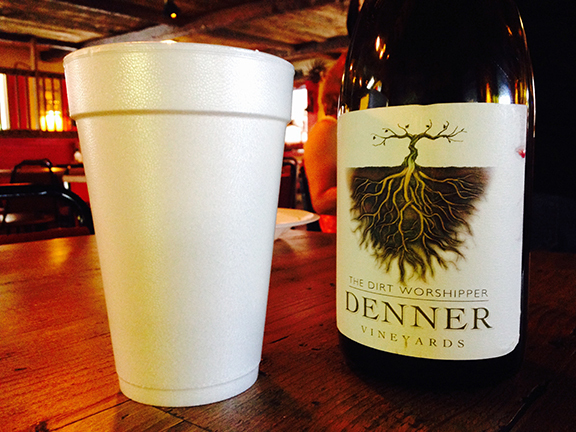 And Americans still love big, bold red wine like the Denner, above. Above: reading the back label for the Denner, it’s clear that the people who make it put a lot heart into delivering an outstanding expression of Syrah. At roughly $50 a pop, it’s indicative — in my view — of where American wine tastes continue to focus. For many people, big and bold is the only way to go with bbq, a cuisine based on intense aromas and flavors (my clothes and hair smelled so strongly of smoke after we visited Roegels that I took a shower after we came home from our meal; not unusual when you visit a genuine bbq joint like Roegels, which I enjoyed immensely). I always prefer leaner, lower-alcohol, and higher-acidity wines with bbq. I like the way they work as a counterpoint to the fattiness and heavy and often overwhelming flavor of the smoked meats. When I pair with bbq, I look for freshness and present but balanced fruit. Sparkling wine is ideal, I find, especially because of the generally judicious alcohol (the heavy saltiness of the Texas rub makes you thirsty and so you tend to drink more wine when eating bbq). But as Saturday’s gathering reveled, my taste in this case falls outside today’s canon for pairing with Texas-style smoked meats. The Bounty Hunter’s wine director likes to pair “Pinot” [Noir] from Napa and Zinfandel, wrote Chris in his review. When Tracie P and I packed up the kids on Saturday, there was still a half bottle left of the rosé I had brought. Few bbq joints serve alcohol and many of them encourage byob. I remember a surprised manager at Cooper’s in the Texas Hill Country who said he’d never heard of anyone bringing a bottle of wine (as opposed to beer) to the restaurant. That was seven years ago, when I first moved to Texas. On Sunday, the owners at Roegels didn’t even raise an eyebrow when patrons arrived with ice chests filled with expensive, big and bold California wine. Above: Piedmontese grape grower and winemaker Angeleo Gaja in New York in 2012. 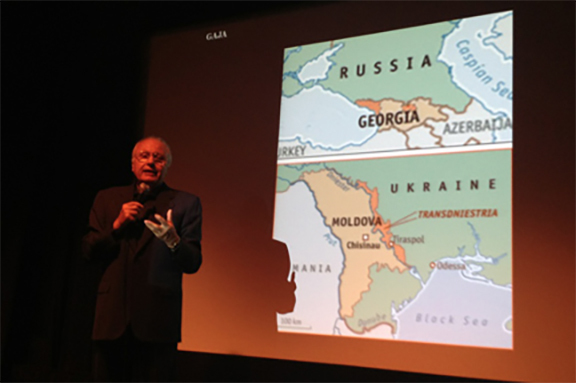 Biodynamic pioneer Nicolas Joly and trailblazing winemaker Angelo Gaja are to face-off in a roundtable discussion entitled “Around the table with Natural Wine… and Unnatural Wine,” to be held on July 12 at the Italy pavilion of EXPO in Milan. The event has been organized by gastronomic entrepreneur and Eataly founder Oscar Farinetti and it will also include spirits and natural wine importer and distributor Luca Gargano, Italian Federation of Independent Grape Growers co-founder Walter Massa, Merano Wine Festival founder Helmut Koecher, and enology professor Vincenzo Gerbi from the University of Turin. 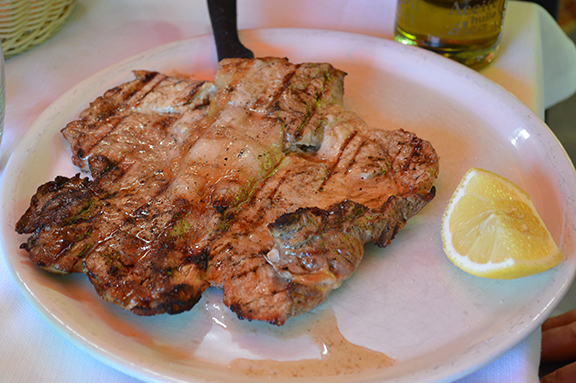 A preview of the gathering was posted yesterday on the Italian food blog Cronache del Gusto. 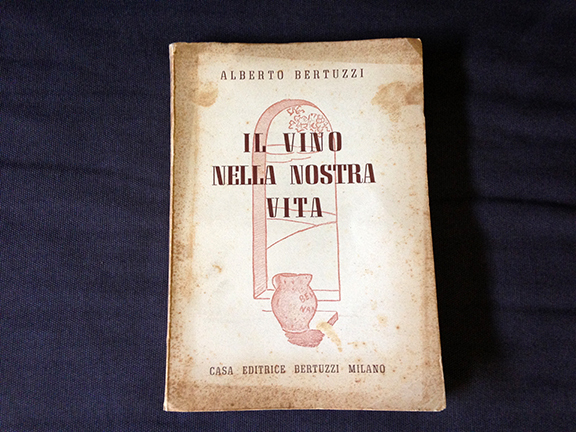 More than two years after the editors of Gambero Rosso published a controversial op-ed by French wine writer Michel Bettane in which he railed against “an invasion of so-called ‘natural’ wines,” the debate over the merits of natural winemaking continues to command the attention of the Italian wine world. But many Italian wine trade observers also seem to have grown tired of the discussion. “I’d rather attend an evening gathering devoted to household cleaners,” wrote enologist and publisher Maurizio Gily on his Facebook today. “Not only is this an idiotic debate,” opined Montalcino winemaker Stefano Cinelli Colombini in the comment thread to Gily’s post, “it’s outdated and stale. Wouldn’t it be better if there were a discussion of the real issues instead of terms and definitions?” he asked. In 1968, a year after I was born in the South Side of Chicago at Michael Reese hospital, Bobby Rush founded the Illinois chapter of the Black Panther Party. 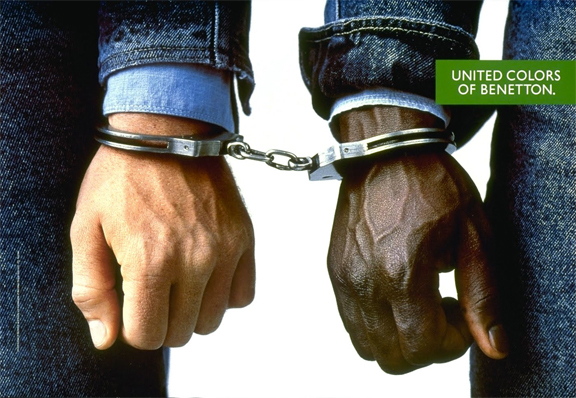 Institutionalized violence against black men in urban areas in the U.S. was so severe that Rush and his fellows felt compelled to arm themselves to protect their communities. But there were no Confederate flags displayed in the city at that time — at least I can’t remember any. In 1970, my family moved to gilded La Jolla, California, where Jews had been excluded from buying property until a University of California campus was established there in 1960. There was only one black kid in my class at Bird Rock Elementary. His name was Michael Green and he and I were friends. 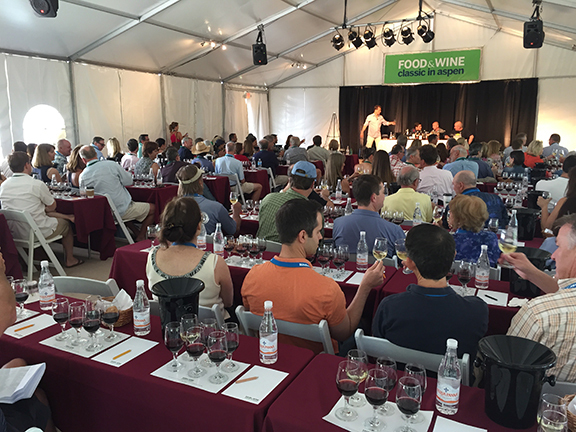 What a thrill for me to be invited to participate in a panel on Italian wines at the swank Aspen Food & Wine festival this year! Tracie P and I decided to make it a romantic vacation (our first time away from Georgia P and Lila Jane for more than one night!). 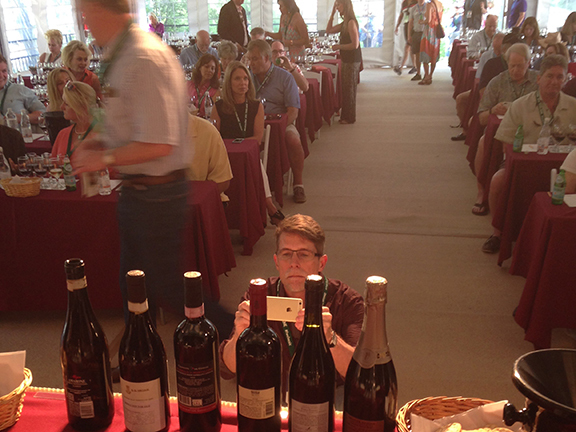 That’s Rick taking a shot of the flight of wines poured at our seminars. 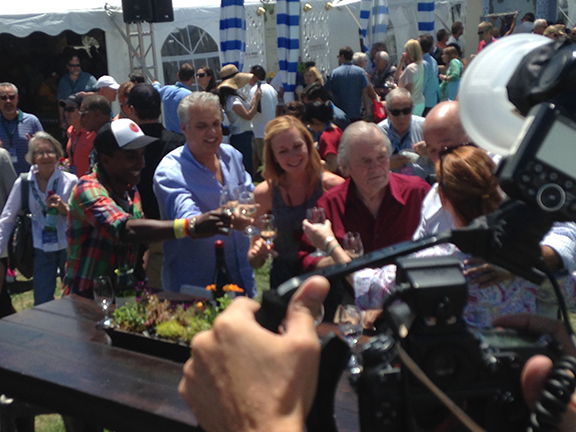 After the first seminar Friday morning, we headed up to the main tasting tent for some A-list celeb watching. Tracie P had her heart set on seeing Jacques Pépin and the paparazzi gods delivered right out of the box. As soon as we entered the tent, there they were (from left, above): Marcus Samuelsson, Eric Ripert, Claudine Pépin, Jacques, and Tom Colicchio. Of course, it wouldn’t be a true Aspen experience if we didn’t get invited to some insane party where ridiculous wines were being poured. 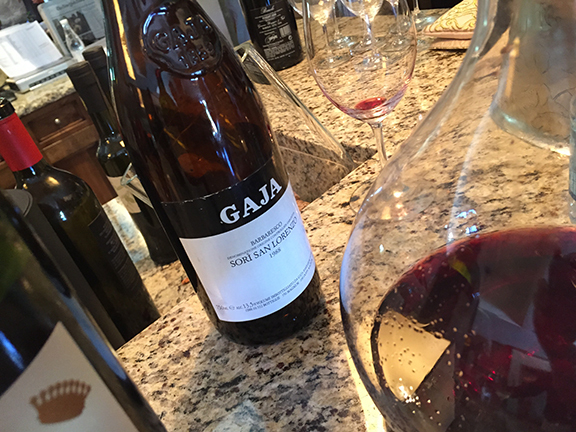 My highlight wine, liberally poured in a suite in the Residences at the Little Knell, was the 1988 Gaja Barbaresco San Lorenzo. So many look to 82 and 85 as great vintages from the decade in Italy. And of course, 1989 was one of the best in Piedmont in the last 30 years. But the biggest thrill for me was pouring and speaking about a Franciacorta wine in the company of bona fide marquee-name Italians like Tignanello and Vajra’s Barolo Bricco delle Viole, among other “big and bold” labels as the seminar’s title promised. 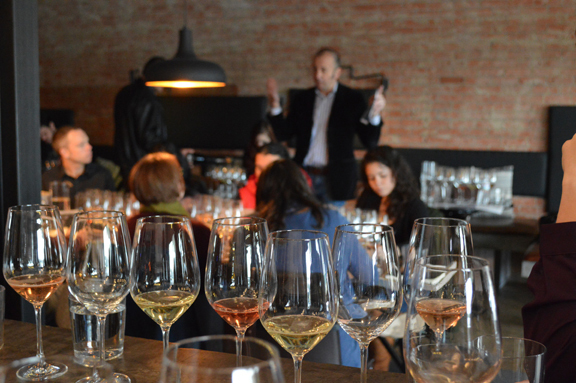 At our first tasting on Friday, I asked the roughly 120 guests if any of them had ever tasted a Franciacorta. Only one person in the audience raised a hand. We poured a Satèn by one of the appellation’s historic and most respected estates. And by all accounts, it was enjoyed by all present. My heartfelt thanks go to seminar organizer Shayn Bjornholm, master sommelier and brilliant speaker and educator, for inviting a rock ‘n’ roller me and allowing me to present an “outside-the-box” wine. Thanks also to fellow panelists Joe Campanale, NYC celeb restaurateur and Food Network star, and master sommelier and Aspen veteran Rob Bigelow. I felt like a nanus gigantum humeris insidens. Thanks also go to our lovely friend and super wine pro Melanie Kaman who got us on the guest list for the fancy party. 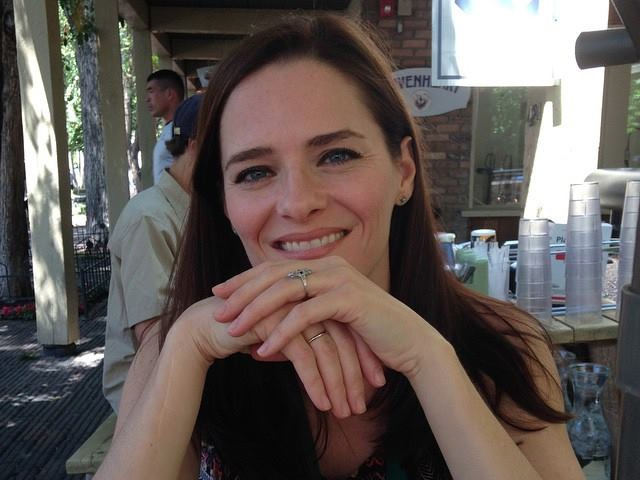 And thanks, most of all, to my beautiful wife Tracie P, for believing in me and my crazy career as an Italian wine scribe. That was one of the most fun weekends of my life, thanks to you, beautiful lady! It was tough to be away from the girls for so long but I’m so glad we did that. I’m now nearly six months into my campaign as an English-language blogger and U.S. trade ambassador for the Franciacorta Consortium. It’s been a fantastic and immensely rewarding experience to dive so deep into an appellation that I love so much. Please support our campaign by coming out to taste with me in July. There is no charge to attend and these will be — by far — the biggest gatherings of Franciacorta wines to ever have been poured in one event in the U.S. Looking forward to tasting with you! I am thrilled to announce that St. Vincent restaurant in San Francisco (one of my favorite restaurants on the West Coast) has just agreed to host our July 15 Franciacorta tasting (see link below). At each of our California and New York tastings, we will be pouring no fewer than 24 different labels, all of which are available (via one channel or another) in the U.S.
And I’ll be giving a short talk on the appellation, its history, its future, and why it stands apart in the world of sparkling wine. Please vote for Do Bianchi @WineBlogAwards! Tropical Storm Bill update: the heavy rain and winds have already begun to hit the coast about an hour from our house. So far, where we live in southwest Houston, things are pretty calm. There have been a few tornado alerts but nothing for our area yet… We’re hunkered down at home with plenty of drinking water in case we lose water or can’t get out of our neighborhood tomorrow. I have to admit it: deep down inside, I’ve always been kinda sad about the fact that I had never been nominated for a Wine Blog Award. 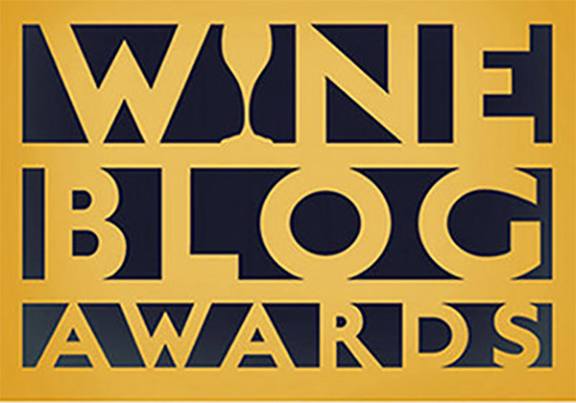 Well, this year, it seems, my luck has changed and I’ve been nominated for “best single subject” wine blog. Thank you to everyone who nominated me! It’s a great feeling to have made the cut this year (for real)! Check out the other nominees here and if inclined, please vote for Do Bianchi! Last week, a heated and racially charged exchange on social media between a winemaker and a high-profile wine writer consumed the attention of wine lovers and professionals in the Italian wine world. I was still in Italy last Friday when I began receiving screenshots of the thread (these days, social media users circulate screen-grabs so as to avoid clicking on the pages of the persons involved and raising their results in search engines). The producer asked the writer to refrain from posting racially charged comments in the thread. Racial tensions are coming to a boil in the country as the Italian government and citizens face a growing immigration crisis. Every day countless migrants hazard the Mediterranean crossing from North Africa, many of them shipwrecked along the way as they search for a better life in Europe. Italy is their main point of entry. Many of them have perished before reaching European soil. Last week, French officials began refusing entry to migrants who were making their way north. The wine writer is from Lombardy and lives and works there. The grape grower lives and works in Liguria, along the coast, not far from the French border where the migrants have become refugees. It’s never pretty when racial tensions spill over into the world of wine. And this ugly episode, the most recent in a string of racially charged exchanges and the subsequent online shaming, reflects the nation’s extremely taut mood with regard to the browning of Europe, to borrow the American phrase. When the African-American poet Langston Hughes traveled to Italy in the 1920s, the townspeople of his host’s city (Desenzano in Lombardy) had never seen a black man before. In 1989 (the year that the image above was first published), I was a second-year student at the University of Padua (in Veneto). 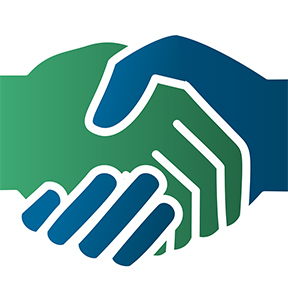 I remember how a good friend announced — with equal pride and trepidation — that the trucking company he worked for had hired an African for the first time. At that time, the EU was not yet in place and Africans were first making their way to Italy in significant numbers. My friend and I discussed race relations nearly every day. Today, the mounting, looming immigration and refugee crisis makes the subject of race and race relations impossible to avoid. I’ve spend three weeks in Italy over the last two months: not a day passed that the topics didn’t come up in conversation with my friends, colleagues, and hosts. After scores of social media users posted notes of solidarity on the producer’s social platform, the winemaker asked friends and colleagues “to turn the page” and move on. As an envoi to the episode, the grape grower posted the following lines from the 1991 novel Vento Largo (Large Wind) by twentieth-century Ligurian writer Francesco Biamonti. The title of the book is inspired by the sailing term large wind. The book’s themes address human loneliness and how it pushes us to extremes as we seek to escape it. At one point, the central character, a ferry pilot who seeks to aid clandestine migrants, remembers the lines of a song sung by his young would-be lover. Even if we live all of our years in the same place, we are all migrants as we pass through life. Our souls are constantly searching the highest peaks of our dreams in hope of finding meaning, fulfillment, and peace on our journey on the earth. As the Europeans face what often seems to be an insurmountable issue, let’s hope that they and we can all remember the humanity of our refugee sisters and brothers and the humanity that resides within us. Writing on the fly this morning as my three-day tour of Lambruscoland has come to an end and I head back to Milan to get on a Texas-bound flight. 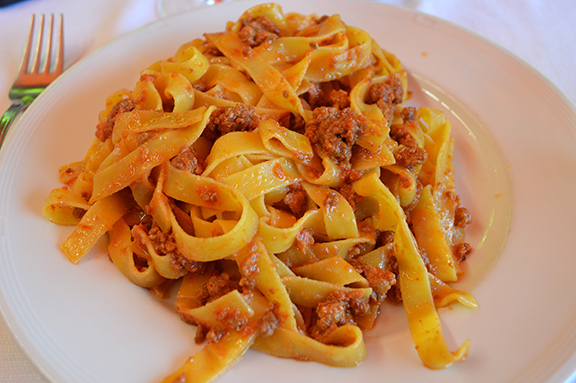 I just had to share these images from lunch yesterday and my new favorite restaurant in Emilia, Trattoria “La Grande” da Silvano in Lagrande, a hamlet in Nonantola township in Modena province. We went to so many fantastic, iconic restaurants on this trip (and I have much more to tell and post). But Trattoria “La Grande” had everything going for it: Silvano, the classic “inn keeper,” the homemade vinegars (balsamic and red wine), a self-serve vegetable bar, and that “prosciutto steak,” as he called it, in the photo above, and the best tagliatelle al ragù I had on the trip, in the second photo. I loved LOVED this place!